I know I've talked about comfort zones before, but with today's motivational quote I decided to touch on it again because it was a great reminder that I needed. It was actually kind of ironic because I had just sent a message to Michael this morning about some changes we've been discussing and how it will get me out of my comfort zone. And then about 2 1/2 hours later I went to go journal and the daily motivational quote was about getting out of your comfort zone. The changes we've been discussing will be more emotionally and mentally out of my comfort zone, but still I'll be pushing myself in a new way that will help me grow and become better. I even made the comment I think I've gotten too comfortable and maybe that's part of my problem. 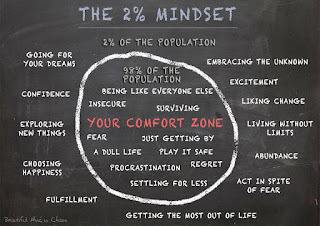 The inserted picture has a great illustration of what can happen by staying in your comfort zone, along with what you can gain by allowing yourself to push yourself outside that comfort zone. I personally can relate to pretty much everything listed in the illustration. But, I want to go ahead and talk about what I've personally experienced by staying in my comfort zone as well as what happens when I allow myself to get out of my own way and become uncomfortable. So what happens if I don't allow myself to get out of my comfort zone? What happens if I become comfortable with where I'm at and what I'm doing? I've learned that I stop growing, improving, and I stop getting results. I notice it on the scale, in my assessment measurements, in my clothes, and in my workouts. I start to even feel it mentally and emotionally. But the other thing that happens is I stop enjoying what I'm doing. I no longer feel challenged and start losing motivation. Then that leads to overthinking and wondering what's wrong with me and what I need to change. I find myself starting to shut down and not want to be around people. But what happens if I do push myself out of my comfort zone? What happens when I avoid things or situations that make me uncomfortable? This is when I find myself facing challenges, which keeps me from feeling like I'm in a rut or bored. It keeps me motivated and striving to do more and be better. It pushes me to get out of my own way, to get me out of my own head, so I'm doing more than I thought I could. And this leads to me feeling better physically, mentally, and emotionally I also see the results on the scale, in my assessments, clothes, and in my workouts. 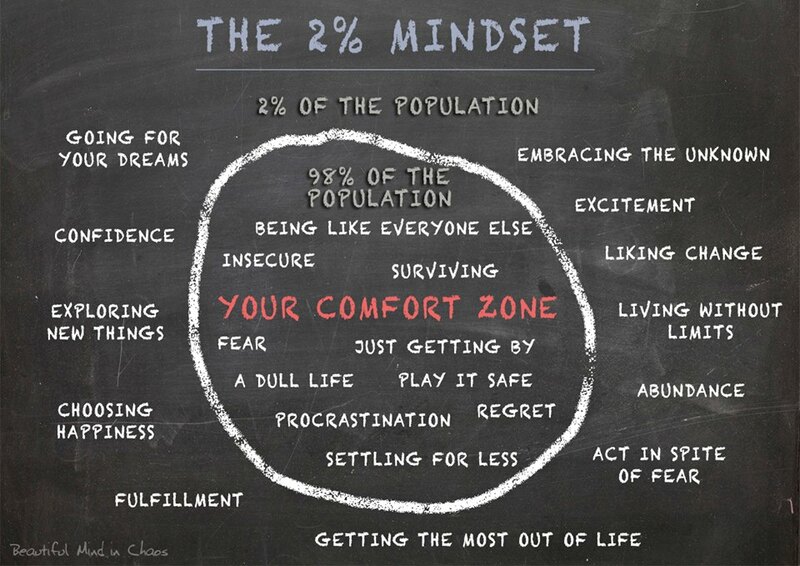 The question then is how can we continue pushing ourselves outside our comfort zone? First, I believe we need to be able to recognize those feelings or triggers that we get when we start to get too comfortable. Then reflect on what you're doing. Ask yourself, "What can I change?" "What can I do different or add?" And here's the ironic part, the things that scare you, make you feel anxious, or you doubt are more than likely the things you should do to get out of your comfort zone. Now to my day. Kind of crazy and hectic, but I found myself not stressing. I just stayed busy rushing around. Another system issue kept me busy running up and down stairs to other departments. I feel like I got an extra cardio workout in I went up and down the stairs so much today. The issue isn't fixed, but I have the people who can fix it on the situation. And then the two things I had planned after work didn't happen. I cancelled running for a couple reasons. One, it's way too cold as it's 25 degrees here in Tulsa. We were going to meet up still and do some cardio inside the studio, but the two girls who planned on coming ended up not being able to make it so I decided to stay at work a little longer to work on some things I didn't get done due to the issues I had been dealing with. Then I was supposed to meet with someone to talk to them about what they are wanting and needing to start their health and fitness journey. She ended up not being able to make it, but I was already at Panera. I had my coffee, was working on this blog post, when she texted that she couldn't make it. Which is fine, we've been trying to meet up for a couple weeks and both of us had things come up where it didn't happen, but we'll eventually meet up. But it actually allowed me me to realize something about myself. This gave me an opportunity where I was creating space for myself and working on things to benefit me. I'm enjoying being able to sit here and just think and write while drinking some coffee, which coffee will be mentioned in our fit tip for today! :) I even started to brainstorm about a new writing project, something I've been wanting to do and never started. I actually think I found a new outlet for me to create space for myself where I can process my thoughts and emotions through writing. FIT TIP - Coffee can improve your cognitive function, increase dopamine levels + stimulate your workout 10-15% longer. Sip a cup before your workout for a java jolt of energy. Bonus, it's happiness in a cup! Remote start and heated seats in my car. I know this isn't a necessity and it's more of a luxury, but when it's 20 degrees at 4:30 AM, I'm grateful I have that remote start to get my car warmed up before I have to step out in that cold. And then just as grateful that I can turn on the seat warmers and warm up my tush. The time I get to myself to just focus on me, especially when I don't even have to plan it. I realized being able to just sit in a cafe, drinking coffee and writing my thoughts and emotions, is a really great outlet for me. My job and the company I work for. We all have days that don't go right, and even days that we don't want to go into work. But being able to work for a company that is employee oriented, as well as customer oriented, it really helps to get through those days easier. I have a great boss, work for a great department, and the company itself I'm grateful for.